Yet another paper lends support to the idea that the Flores Hobbit is a seperate species and not a deformed human. 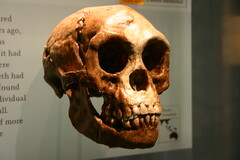 This time, a study uses cladistics, or the comparison of physical characteristics to determine ancestry, and determined through computer modelling that homo floresiensis split off from homo sapiens nearly two million years ago. Pretty exciting stuff because of the unexpectedly early date, which, if proven true from later finds, will force a rewrite of how we understand how early man came about and populated the earth. However, as with all the hobbit studies previously published, we’ve still been looking at only one set of bones. I think what we really need now is some independent confirmation in the form of another hobbit find.